A winning week at Liet International XXL! This week saw us hitting the road once more, and there was a LOT of road to travel! We were headed for Liet International XXL in Leeuwarden, Friesland NL. We set off with a sense of anticipation, this was an adventure into the unknown, a province and an event that none of us had been to before. We arrived on Monday evening in Leeuwarden to be greeted by Tjallien, Coordinator of Liet International, who was as friendly and welcoming as the city was beautiful...very! She showed us to our accomodation, a sailing ship moored up in the centre of the city. It was an impressive home for the week, though with about 30 people on board and the four of us in a rather bijou cabin we got the sense it would be rather 'cosy' and we would get to know our fellow musicians very well...After some time to settle in and get our bearings we found our most important location, a pub by the canal, and were soon joined by the familiar faces of Mark Trevethan, Cornish language lead and judge for the week, Whyte from Scotland who we had met previously at the Pan Celtic festival and other groups and artists from across Europe. It was our first taster of the week to come, and we had a feeling it was going to be good, even if the mildly claustrophobic member of the band swapped cabin for car on the first night at bed time! Tuesday was our soundcheck day, and first experience (other than mealtimes) of Neushoorn, the venue for the competition the following day. It was a fantastic venue with the most relaxed sound and stage team we've worked with! 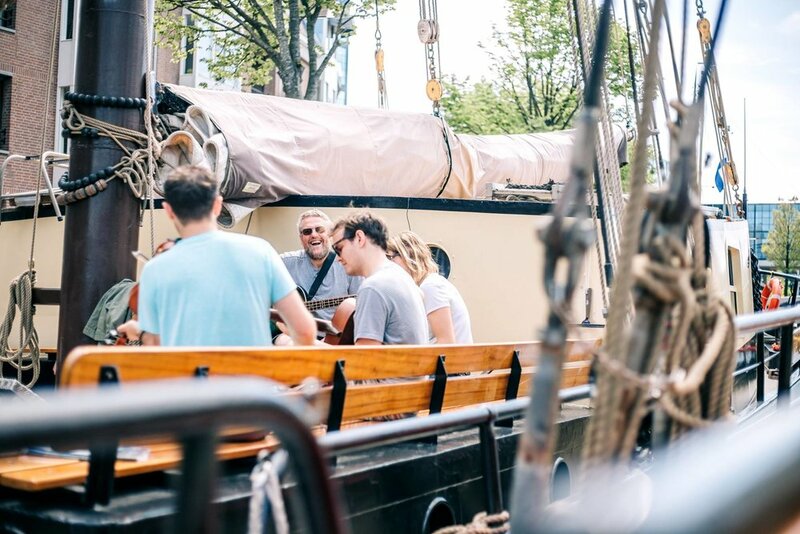 After soundcheck we played some tunes on the ships deck, had some photographs taken by the talented Aron Weidenaar and listened to the beautiful music of Gerda Stevenson and Kyrre Slind. 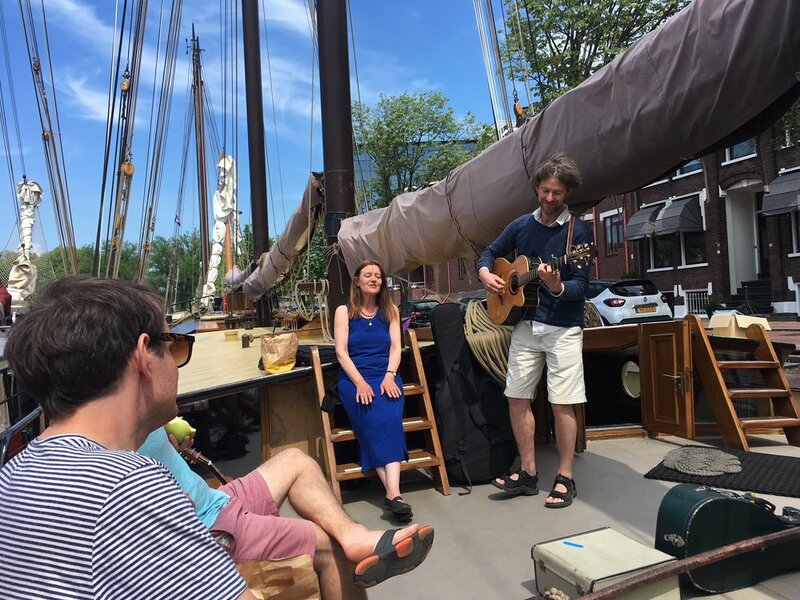 Tuesday's highlight had to be the boat trip we were taken on by new friends, amazing musicians and 'expert' local tour guides Luko Reinders and Bas Postma. 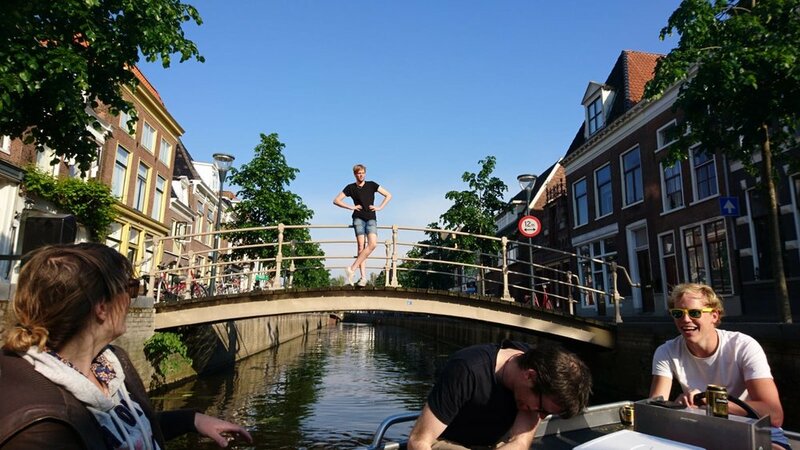 We spent 3 hours navigating the canals of Leeurwarden in the sunshine and in the wonderful company of Luko, Bas, Whyte and Billy Fumey. There was added excitment as we went off the reccomended route (a deliberate mistake by Luko and Bas of course...) and ended up lying in the bottom of the boat to get under what must surely be the worlds lowest bridges! Laura even managed a swim, but should perhaps have thought about how to get back in the boat before getting out...We topped the day off with a night out at local bar Scooters, where we gave the locals a taste of Cornish folk, probably not something they've experienced before at their regular jam nights! Thankfully Tom had played so much music during the party that he hadn't had much time for beer and was within the driving limit, so at 4am we packed up and instead of going to bed we hit the road. It's a long way from Leeuwarden to Cornwall...16 hours to be exact! In the film Austin to Boston, Gill Landry comments that "we find ourselves here quite often saying goodbye again and again....after all, the road is just one long goodbye". The sadness we felt at leaving is testament to the friendships we made, and the extraordinary people we met. It is always the people we share an experience with that make it special, and thankfully we find in this strange musical world we're in whilst we can never go back and relieve an experience we often get to meet people again in other contexts and make new memories. Thank you to the organisers of Liet International for putting on an event that shares and promotes minority languages, we learned so much about other languages and cultures whilst we were there! We were looked after so well by all involved and are so grateful for the opportunity you gave us. We hope to see you all for another adventure one day! Newer PostA weekend in East Anglia, new projects...and a new band member! Older PostThe Rowan Tree & The Grenaways play Echos & Merveilles, Toulouse!